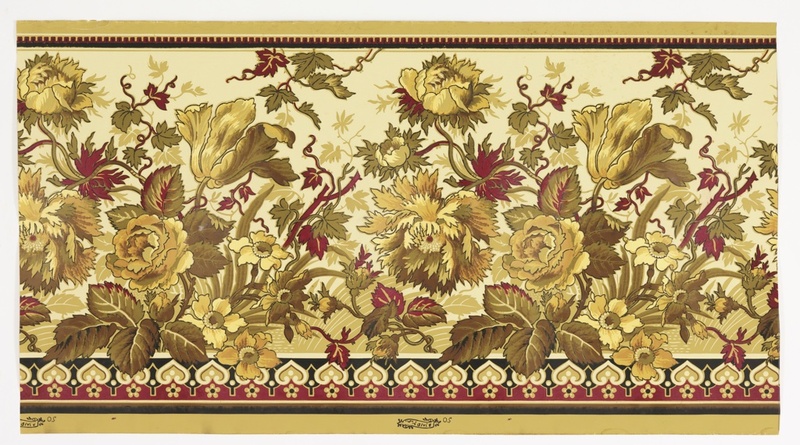 A rather severe group of peonies, roses and other flowers grow with grape vines in a tangled mass on this wallpaper frieze of the late-nineteenth century. Dark outlines and blocky coloring causes the blossoms to appear stylized and two-dimensional. Instead of subtle shading, the illusion of depth is created by overlapping the floral elements. The colors chosen for the design are also unrealistic, and the natural pinks, whites and spring greens of these species have been disregarded in favor of ochre, brick and olive on a beige ground. The floral scene is fenced in by Moresque borders in matching colors. The earthy tones, references to Asian art and flat, conventionalized depictions of flora are hallmarks of the American Aesthetic style, which was quite the trend in interior decorating when this wallpaper was produced. Sadly for the AWPMA, their ‘wallpaper monarchy’ was not to last, and they were dissolved by the United States government in 1887.